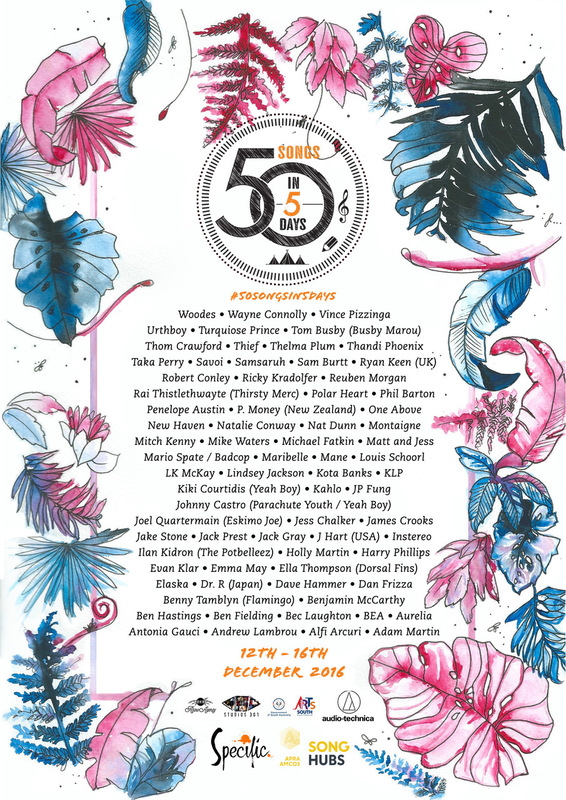 In partnership with APRA AMCOS SongHubs, Specific Music hosts Australia's largest songwriting event '50 Songs in 5 Days'. It is a magical week, typically in December, that brings together over 100 of Australia's top songwriters, artists and producers to collaborate and write new songs in the ultimate networking environment. During the 5 days of Songwriting, previously hosted at Studios 301, are 3 networking / socialising events giving everyone a chance to connect with not just the writers, but the entire Music Industry. Gibson Guitars and Audio Technica are some of our generous sponsors that Have supplied beautiful guitars and equipment for all of the writers to try out, and Studios 301 supply a handful of world class studios. It is a week of making hits, making friends, and opening doors! Previous participants include : 5 Seconds of Summer, Joel Little, Montaigne, M-Phazes, Jessica Mauboy, Briggs, Thelma Plum, Kate Miller Heidke, Art vs Science, Julian Hamilton (The Presets), Jarryd James, Taylor Henderson, Trials, KLP, Jon Hume, Louis Schoorl, Pip Norman, The Mclymonts, Adam Eckersley, Amber Lawrence, DNA, Lindsey Rimes, Phil Barton, Ilan Kidron, Rai Thistlethwayte, Tom Busby, Georgie Kay, Alex Hope, Penelope Austin, and many, many more.